Railway Mission offers a number of opportunities for people interested in our work. If you’ve read about or experienced Railway Mission’s work, and feel you have something special to offer, you may like to apply to join our team. From time to time we have vacancies for paid and voluntary full and part-time chaplains, along with posts for support staff. Please see our current vacancies below. Please note that we are only able to accept applications for advertised vacancies. Want to support Railway Mission with a donation? That’s fantastic – thank you! We can’t do our vital and unique work without your generosity, so please visit our Donate page. Keen to hear more from us? 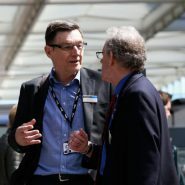 Why not sign-up to receive regular Railway Mission updates? We publish a quarterly magazine – Railway Mission News – along with quarterly chaplains’ prayer bulletins and a weekly prayer email. If you’d like to receive any of these, please complete our online Publications Request form.